It's that time of year.. That's right! Pumpkin.. Pumpkin pie, pumpkin mousse.. And this easy, peezy, yummy pumpkin mousse parfait I nicked from Funtimesmadeeasy.com. They have lots of yummy recipes, so go check em out. Step 1: Add a layer of pumpkin mouse to a cup. 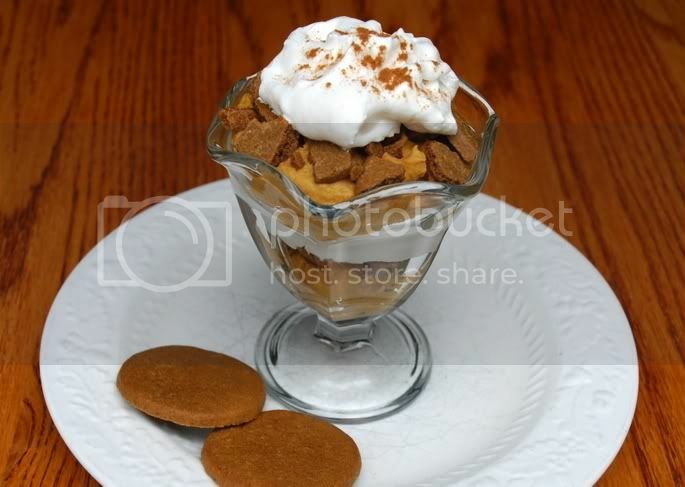 Step 2: Sprinkle ginger snap crumbles over the pumpkin mousse. Step 3: Spoon a layer of whipped cream over the ginger snap crumbles. Step 4: repeat steps 1-3. Garnish with a dash of cinnamon. Start out with less pumpkin mousse and whipped cream than you think you’ll need; otherwise you won’t have room for several different layers. To make the ginger snap crumbles without a big mess, put them in a ziploc bag and use a rolling pin or a can of vegetables to crush them.